(a) to (d) A Statement is laid on the Table of the House. (a) Yes, Madam. 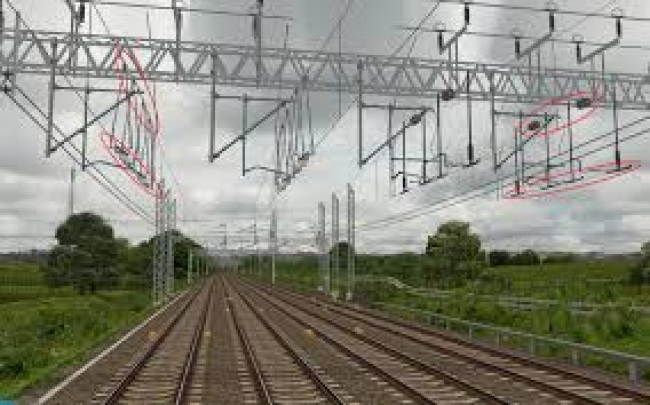 Ministry of Railways has planned for 100% electrification of Broad Gauge (BG) routes and accordingly work for electrification of balance BG routes of 13,675 Route Kilometer (RKM) has been approved at a cost of 12,134 crore. With above, Indian Railways will be first major railway in world to have 100% electrified BG railway network of such size, confirming its commitments towards green and clean environment. (i) Reduced energy bill of Railways by about ` 13,000 crores per annum. (ii) Reduction in diesel oil consumption by about 2.8 billion liters, thereby reducing dependence on imported diesel oil and saving foreign exchange. (iii) Amenable to adoption of renewable sources of energy like solar, wind power. (iv) Haulage of heavier freight and longer passenger trains at higher speed due to higher haulage capacity of electric loco. (v) Increased capacity of railway network due to reduced detention and seamless transport on electric traction. (vi) Reduce carbon emission and improve environment particularly in cities like New Delhi. 36 Badarpur-Jiribam,Katakhal- Bhairabi & Badarpur- Karimganj-Sabroom incl. 53 Phagwara Jn. - Nawanshahar Doaba-Jaijon Doaba incl.